In a picture-perfect illustration of nature?s elegant sense of balance, the icy, snowcapped peaks of the Swiss Alps were thoughtfully placed atop a valley filled with natural thermal springs. ?This perfect apr?s-ski indulgence was, of course, in place long before skiing was even invented ? in fact, mentions of the benefits of a nice hot soak in the shadow of the Matterhorn date back to the 13th century. 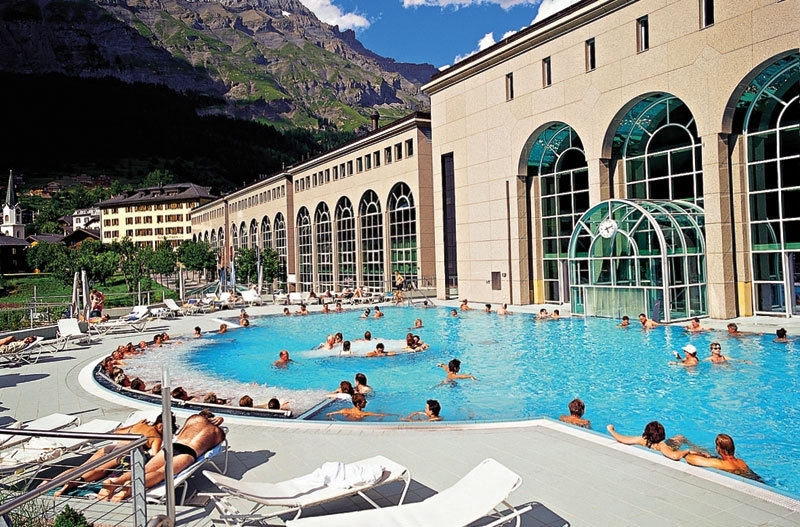 Here are three places, each just a mere two to three hours from Zurich, where Alpine bathers can continue to enjoy modern versions of a Roman-era pleasure. In addition to offering a full range of spa treatments, including its signature Cleopatra Bath ($50) and Matterhorn Hot Stone Massage ($136), Salina Maris is unique in that its spa waters are enriched with natural brine, which it claims is ?curative for a number of conditions ? everything from arthritis, menstrual difficulties, respiratory ailments ? even the stress of ?manager burnout. ?